Dr. Weeks’ Comment: David Stetzer (www.stetzerelectric.com) documented this electrical pollution at wind farms almost a decade ago. I lectured about this 4 years ago (see prior posting). People are now catching on and trying to correct the problem. The toxicity is measurable and remediable. By the way: Solar farms are equally as toxic. It was Uplawmoor’s tranquillity and wild beauty that drew civil servant Aileen Jackson to settle there 28 years ago. She’d had enough of life in the big city. Now she wanted somewhere quiet and rural to start a family, keep her horses, and enjoy the magnificent views down the valley and out to sea to the western Scottish isles of Arran and Ailsa Craig. Then, two years ago, she says, it all turned sour. A neighbour with whom she and her family had been friends decided to take advantage of the massive public subsidies for ”˜renewable’ energy. 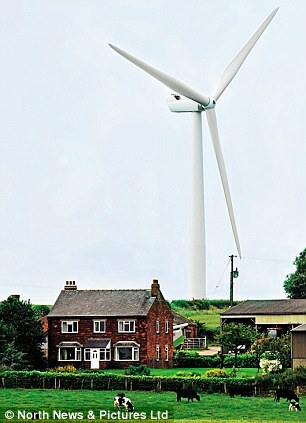 He put up a 64ft-high wind turbine which, though on his own land, stood just 300 yards from the Jackson family’s home. The sleepless nights caused by its humming were only the start of their problems. Far worse was the impact on their health. Aileen, a diabetic since the age of 19, found her blood glucose levels rocketing – forcing her to take more insulin and causing her to develop a cataract, she says. Her younger son, Brian, an outgoing, happy, academically enthusiastic young man, suddenly became a depressive, stopped seeing his friends and dropped out of his studies at college. Aileen’s husband William, who had always had low blood pressure, now found his blood pressure levels going ”˜sky high’ – and has been on medication ever since. So far so coincidental, you might say. And if you did, you would have the full and enthusiastic support of the wind industry. But in order to believe that, you would have to discount the testimony of the thousands of people just like Aileen around the world who claim their health has been damaged by wind farms. You would have to ignore the reports of doctors such as Australia’s Sarah Laurie, Canada’s Nina Pierpont and Britain’s Amanda Harry who have collated hundreds of such cases of Wind Turbine Syndrome. And you’d have to reject the expertise of the acoustic engineers, sleep specialists, epidemiologists and physiologists who all testify that the noise generated by wind farms represents a major threat to public health. ”˜If this were the nuclear industry, this is a scandal which would be on the front pages of every newspaper every day for months on end,’ says Chris Heaton-Harris, the Conservative MP for Daventry who has been leading the parliamentary revolt against wind farms, demanding that their subsidies be cut. Wind Turbine Syndrome. Until you’ve seen for yourself what it can do to a community, you might be tempted to dismiss it as a hypochondriac’s charter or an urban myth. But the suffering I witnessed earlier this year in Waterloo, a hamlet outside Adelaide in southern Australia, was all too real. The place felt like a ghost town: shuttered houses and a dust-blown aura of sinister unease, as in a horror movie where something terrible has happened to a previously thriving settlement but at first you’re not sure what. 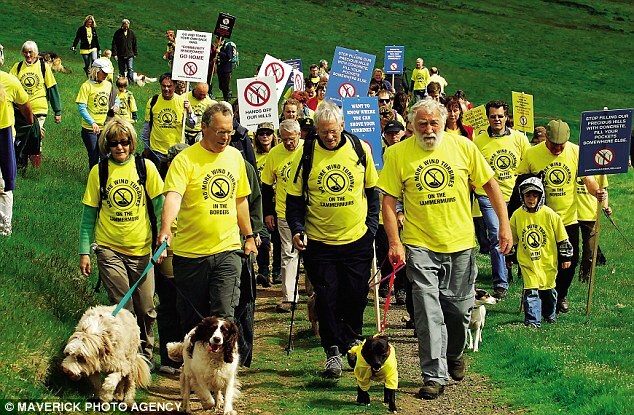 ”˜The wind farm people said we’d be doing our bit to save the planet,’ said one resident. ”˜They said these things were quieter than a fridge. They said it was all going to be fairy floss and candy. I’ve since heard dozens of similar stories from nurses, farmers, panel-beaters, civil servants, businessmen and forestry workers across the world, from New South Wales to Sweden and Pembrokeshire. The symptoms they claim to have suffered may vary – dizziness; balance problems; memory loss; inability to concentrate; insomnia; tachycardia; increased blood pressure; raised cortisol levels; headaches; nausea; mood swings; anxiety; tinnitus; palpitations; depression – but the theme remains the same. Here are ordinary people who settled in the country for a quiet life only to have their lives and property values trashed at the stroke of a bureaucrat’s pen. In December 2011, in a peer-reviewed report in the Bulletin of Science, Technology & Society, Dr Carl Phillips – one of the U.S.’s most distinguished epidemiologists – concluded that there is ”˜overwhelming evidence that wind turbines cause serious health problems in nearby residents, usually stress-disorder type diseases, at a nontrivial rate’. According to a study by U.S. noise control engineer Rick James, wind farms generate the same symptoms as Sick Building Syndrome – the condition that plagued office workers in the Eighties and Nineties as a result of what was eventually discovered to be the Low Frequency Noise (LFN), caused by misaligned air conditioning systems. The combination of LFN and ”˜amplitude modulation’ (loudness that goes up and down) leads to fatigue, poor concentration and dizziness. And sleep specialist Dr Chris Hanning believes it stimulates an alert response, leading to arousal episodes throug the night that make restful sleep impossible. But if the problem is really so widespread, why isn’t it better known? The short answer is money: the wind industry is a hugely lucrative business with millions to spend on lobbying. What’s more, until recently, it benefited from the general public mood that ”˜something ought to be done about climate change’ and wind power – supposedly ”˜free’, ”˜renewable’ and ”˜carbon-friendly’ – was the obvious solution. ”˜For years among the metropolitan elite it has been considered heretical to criticise wind power,’ says Heaton-Harris. In the last decade, however, a host of evidence has emerged to indicate it is not the panacea it was thought to be. From economists such as Edinburgh University’s Dr Gordon Hughes we are told that wind energy is unreliable and intermittent, with no real market value because it requires near 100 per cent back-up by conventional fossil-fuel power. From research institute Verso Economics we are told that that for every ”˜green job’ created by taxpayer subsidy, 3.7 jobs are killed in the real economy. It is said that thanks to the artificial rise in energy prices caused by renewable subsidies, expected to reach £13 billion per annum by 2020, at least 50,000 people a year in Britain are driven into fuel poverty. And newly released Spanish government research claims that each turbine kills an average 300 birds a year (often rare ones such as eagles and bustards) and at least as many bats. Yet still, despite collapsing share prices and increasing public scepticism, the industry continues to grow. Aristocratic landowners have done especially well, such as the Earl of Moray (£2 million a year from his Doune estate) and the Duke of Roxburghe (£1.5 million a year from his estate in Lammermuir Hills). South of the border, the Prime Minister’s father-in-law Sir Reginald Sheffield makes more than £1,000 a day from the eight turbines on his Lincolnshire estates. Even smaller landholdings can generate a tidy profit: around £40,000 per year, per large (3MW) turbine, for no effort whatsoever. The biggest winners, though, are the mostly foreign-owned (Mitsubishi, Gamesa, Siemens) firms for whom wind was until recently a virtually risk-free investment. In Britain, onshore wind farms are subsidised by a levy on consumer bills at 100 per cent; offshore wind is subsidised at 200 per cent: no matter how little energy the turbines actually produce, in other words, healthy returns are guaranteed. 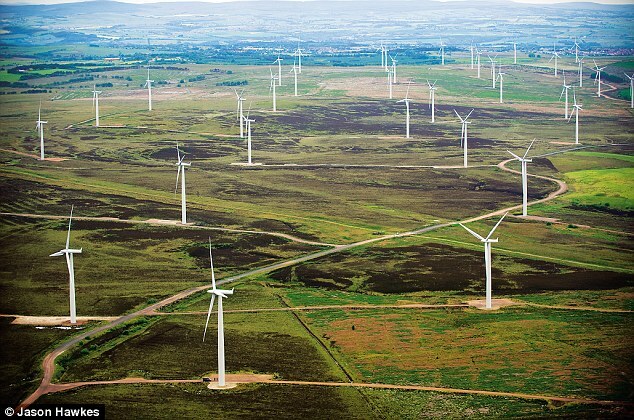 The debate over wind farms has aroused huge passions. ”˜I’ve had death threats. I’m told I’m a witch. I’ve had my reputation trashed in the newspapers,’ says Australian campaigner Dr Sarah Laurie. 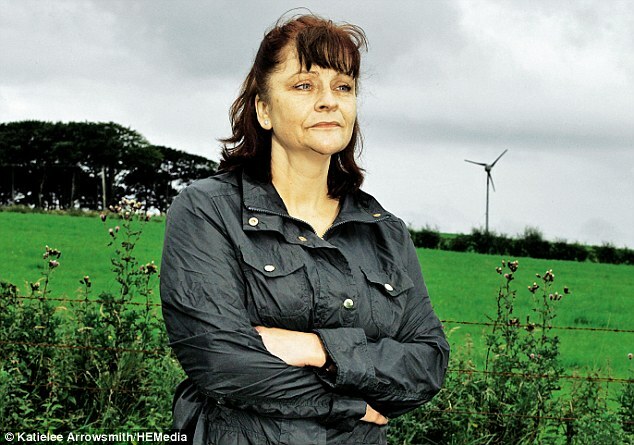 When Aileen Jackson protested about some of the 23 new turbine projects proposed for Uplawmoor, she too was threatened. Her car, she says, was vandalised; broken glass was strewn in her horses’ field; on two occasions she found her horses’ anti-midge coats had been cut off and slashed to pieces, the horses left covered in blood from where they rubbed themselves against a fence to stop the itching. There’s no suggestion anyone locally concerned with wind farms was involved. But legitimate proponents of wind farms are candid about the benefits. ”˜There’s so much money to be made from these things, that’s the problem,’ says Jackson. What horrifies the communities threatened by wind farm developments is how powerless they are to stop them. At Northwich in Cheshire, I attended the annual meeting of National Opposition to Windfarms (NOW), where lawyers including Lord Carlile (NOW’s chairman) advised local protest groups on how to challenge wind developments in their area. The desperation was palpable. Current planning laws have a presumption ”˜in favour of sustainable development’. Wind farms are deemed vital to Britain’s EU-driven campaign to cut its carbon emissions by 20 per cent by 2020. Arguments about wind turbines’ public health impacts seem to cut little ice with planning inspectors. The whole system has been rigged in the industry’s favour. One of the biggest bones of contention is regulation of acceptable noise levels. In Britain, wind developers are bound by ETSU-R-97, a code that places modest limits on sound within the normal human hearing range – but which fails to address the damaging aspect of wind turbines: infrasonic (ie, inaudible) Low Frequency Noise. But according to RenewableUK’s ”˜Top Myths About Wind Energy’ section, accusations that wind farms emit ”˜infrasound and cause associated health problems’ are ”˜unscientific’. 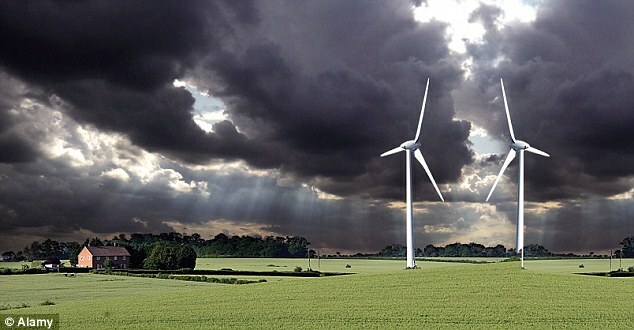 And Robert Norris, head of communications at RenewableUK, says: ”˜There’s no evidence to link the very low levels of noise produced by wind farms with any effects on people living nearby. Dr John Constable Director of the Renewable Energy Foundation adds: ”˜Audible noise disturbance from wind turbines, particularly at night, is known to be a very serious and fairly common problem, but low frequency noise is a mystery. Dr Alec Salt, a cochlear physiologist at the Department of Otolaryngology at the Washington University School of Medicine in St Louis, Missouri, has studied the topic since the Seventies. ”˜The idea that there is no problem with infrasound couldn’t be more wrong,’ he says. Audible sound stimulates the inner hair cells on the cochlea (the auditory portion of the inner ear), but LFN triggers the outer hair cells, sending neural signals to the brain. Military special ops departments have known about it for some time. A 1997 report by the U.S. Air Force Institute For National Security Studies notes: ”˜Acoustic infrasound: very low frequency sound which can travel long distances and easily penetrate most buildings and vehicles. Yet as Dr Phillips notes, instead of protecting the public, governments are actually complicit by encouraging wind farm development via generous subsidies. His views are shared by orthopaedic surgeon Dr Robert McMurtry, once Canada’s most senior public health official: ”˜Whatever you think about climate change, you can be sure that wind energy is not the solution. Newspaper columnist Christopher Booker called wind farms ”˜the greatest political blunder of our time’ and ”˜a monument to an age when our leaders collectively went off their heads’. But a recent statement by energy minister Charles Hendry says: ”˜Studies have considered the noise phenomenon known as amplitude modulation (AM) but show that to date only one wind farm in the UK has presented a noise nuisance to residents. The issue has since been resolved. ‘We will keep the issue of AM under review and welcome the additional research on AM that RenewableUK have commissioned,’ in answer to a parliamentary question from Chris Heaton-Harris. ”˜Wind farms are destroying people’s lives, destroying the environment, destroying the economy – but instead of opposing it, all three main political parties are committed to building more of them. ‘And it’s not accidental. This is a stitch-up between the wind lobby and its friends in Parliament and it’s an outrage. Am I the last doctor to learn about the amazing healing properties of this herb? Bravo Sen. Grassley! Shining more light on Big Pharma.